Last year’s The Winner’s Curse was one of my favorite reads. It was the perfect balance of world building, engaging characters that I wanted to hang out with, and dramatic stakes that left the plot firing on all cylinders throughout most of the book. 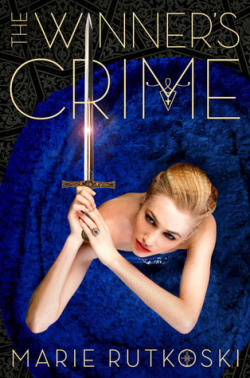 I was eagerly anticipating the second book in this series, The Winner’s Crime, and while I enjoyed it as well, it did suffer from what a lot of second books in trilogies suffer. At the end of The Winner’s Curse, Kestrel has sacrificed herself to save Arin and his people. In return for the Emperor giving Arin and the Herrans their country back as a territory, she promises to wed the Emperor’s lackluster son and eventually rule the country. This saves Arin’s life, considering he led a rebel that killed a lot of wealthy people, and it prevented Kestrel’s father from going to war on two fronts. This leaves her a “guest” of the palace, waiting until the day she’s to wed the Prince, who seems to hate her for existing. Her life is now a constant chess game against the Emperor, who has all the power and is a much wilier player. This second book covers the time she returns from giving Arin the agreement that saved his life and his country, and her wedding that’s to take place on the first day of summer. During the long winter and spring, plenty of balls and dinners and hot chocolate parties in the snow spring up to test Kestrel’s mettle. So The Winner’s Crime still has a winning combination of world building with a more hand’s on introduction to the Eastern country that the Emperor is trying to take over and a charming cast of characters that are somehow always interesting. It does suffer from two things though. A lot of the charm from the first book was formed by Kestrel and Arin’s combative relationship that became a reluctant, but not quite consummated romance. Their chemistry and banter was the part I enjoyed the most, and in this book, by nature of the plot and the fact they’re star-crossed lovers, they spend the majority of it on opposite ends of the world. While their individual adventures are exciting and interesting, the book overall lacks that “OMG MUST READ!” spark of the original because of it. The other reason is the sequel problem of being the middle book, so of course the bulk of it is moving pieces around on the board so everyone is in place for the final end game. There is a little bit of the book that feels a bit like wheel spinning for the sake of releasing a line or two of dialogue that might be important later or simply so player A can get to location B by some rhyme or reason to become useful in the third book. Kestrel is highly isolated through much of The Winner’s Crime and a lot of the secondary characters from the first book are simply missing or only make a passing appearance due to circumstances within the plot. That also made the book seem a little emptier than the first in the series. Despite these complaints, Rutkoski is still a fascinating writer who has built a world that might not be as intricate as some other popular fantasy series these days, but that I found highly entertaining. This second book just didn’t have quite the same sparkle as the first. The Winner’s Crime leaves off on a huge cliff hanger of epic proportions that’s full of miscommunications and deadly circumstances where you can’t imagine how the good guys could possibly win. That just means that the final book in the trilogy will be full of surprises and spectacularly suspenseful scenes that will make the entire journey even more satisfying. I received an advanced copy of this book from the publisher in return for an honest review. All thoughts are my own.